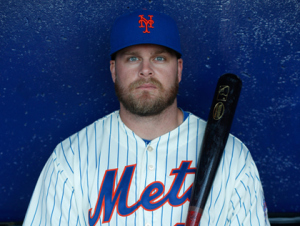 Lucas Duda has recently been seeing more time at first base, his natural position, rather than left field. This decision has reportedly been made solely by Triple-A manager Wally Backman, not from the front office. It’s no secret that Duda never felt comfortable in the outfield, as he could turn even the most routine of fly balls into an adventure. His bat is what got him in the majors in the first place, but he hasn’t fulfilled that power potential, and without that, he have to be a more than capable defensive fielder. Duda went on to discuss his feelings about playing outfield. “I did feel a little bit of added pressure because of my lack of defensive capability,” he said. Only one problem Lucas, THERE IS NO DH IN THE NATIONAL LEAGUE. This is a very telling sign that Duda is not going to have a spot with this team in the years to come. We have seen flashes of his power, but has not hit on enough of a consistent basis to make up for his lack of defense ability. The move to first base makes sense, with Duda looking more comfortable there. But, Ike Davis has been playing better as of late and Josh Satin has earned his spot on this roster, causing a logjam at first base ahead of him. Terry Collins recently told reporters he credited the defense as the reason the Mets have played much better in the last several weeks. That was reference to the solid play outfield play he has been getting out of Eric Young Jr., Juan Lagres and Marlon Byrd. There play has given the Mets the best defensive outfield they have had play together in quite some time. To me, that was a very telling sign that will be no room for players like Duda as long as Terry Collins is the manager. The Mets are building this team around their starting pitching, which will make defensive players all the more valuable on this roster. I expect Sandy Alderson to look into trading Duda during the off-season. Now, Duda won’t have any real value by himself, but maybe if he is included in the right package he can help address one of the Mets other needs. If you the Mets can find an American League team, as Duda is right, he is best suited to be a DH, they may take a chance on him to see if a change of scenery will help get the most out of his bat. I can’t believe Carino cllead me a bloviatah that’s not much love from a fellow paisan. I still don’t undehstand, Carino, why you have a blog devoted to basketball all year. Don’t you know basketball only mattahs from around March 16 to April 5? That’s the only time I follow it.Uhhhh, Eddie, look up how many hits Carino gets with that blog of his. . . Heeeere’s the Mink Man.